This article is a short summary of Mario Tennis: Power Tour. White-Hot Tennis Battles, anytime any anywhere! Take your character all the way to the top in Power Tour mode and master Power Shots in Power Training Mode! Enjoy quick and easy tennis matches with simple controls: press the A Button and B Button in different combinations for a wide repertoire of moves at your fingertips! Up to 4 players can enjoy thrilling multiplayer games! Supports Wireless Adapter! The player's character joins a tennis academy, and must participate in ranking matches to climb through the different classes andranks throughout the academy. 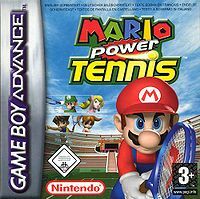 When the player reaches second-to-top rank in the academy's top class, they can participate in the Island Open tournament, the winner of that getting to play tennis with Mario. This page was last edited on 20 September 2012, at 22:42.